The American Legion, Sons of Union Veterans and 125th NY Volunteer Infantry (re-created) at a previous Decoration Day. Before Memorial Day there was Decoration Day, every May 30, when the graves of Civil War soldiers were decorated with fresh flowers. 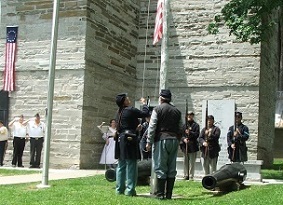 The Old Stone Fort Museum continues the tradition on Tuesday, May 30 at 6:00PM, in collaboration with local chapters of the Sons of Union Veterans of the Civil War and the American Legion. The first Decoration Day observance in Schoharie County occurred in Cobleskill in 1877, by the Civil War veterans organization the Grand Army of the Republic or GAR. That organization was later succeeded by the Sons of Union Veterans. Since 2009, the Corporal James Tanner Chapter of the Sons of Union Veterans have been re-creating this ceremony at the Old Stone Fort’s Civil War monument and in the nearby cemetery where some 34 Civil War gravestones are located. The Schoharie County American Legion and Legion Riders will participate in a wreath-laying ceremony at all the war memorials in front of the Revolutionary War stone fort, and the Sons will re-enact a GAR monument rededication ceremony. Then a procession of reenactors, veterans and the public will proceed through the cemetery laying fresh flowers on each of the Civil War graves. The activities will conclude with a bugler playing “Taps” at twilight. The event is free and participation by the public is encouraged. The Old Stone Fort Museum will also be open extended hours. Donations of fresh flowers are requested and can be brought to the museum any time Memorial Day or the day of the event. The Old Stone Fort Museum Complex is located in the village of Schoharie at 145 Fort Road, off NY State Rt.30, 2.5 miles south of Interstate 88 Exit 23. The museum is open daily from 10:00 AM to 5:00 PM and from Noon to 5 on Sundays. For information, contact the museum at (518) 295-7192 or visit the website theOldStoneFort.org or here at Facebook page, Facebook.com/oldstonefort.